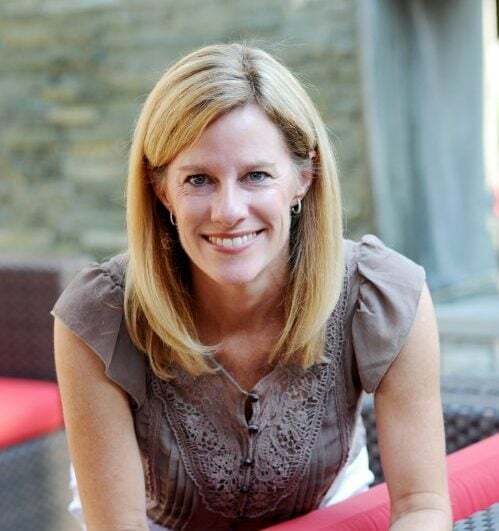 This past holiday season I had dinner at a restaurant called the Guild House, here in downtown Columbus, Ohio. We ordered an appetizer, yes appetizer, of maple roasted brussels sprouts that was topped with finely shredded cheddar cheese and crunchy pecans. These were not your grandma’s brussel sprouts! 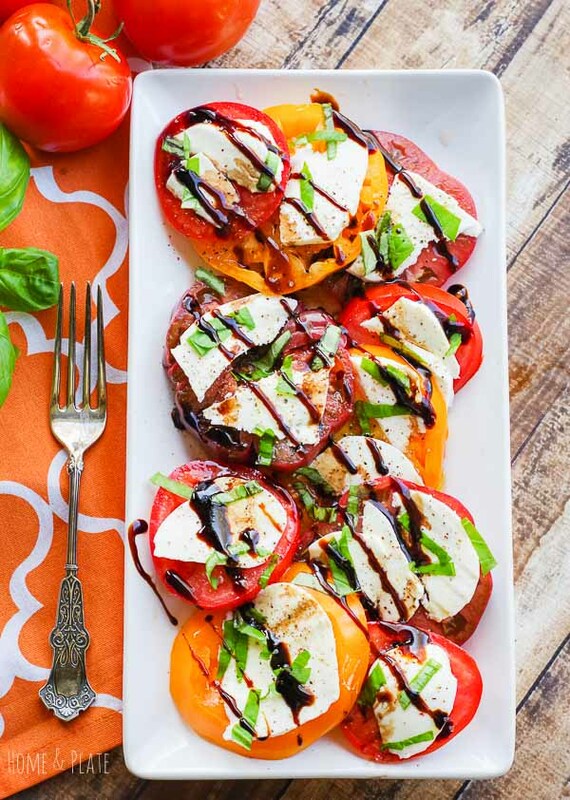 They were caramelized and drizzled with a sweet maple and mustard dressing that transformed this appetizer into something amazing! So I knew I had to try to replicate this recipe. I’ve come along way since my childhood. I don’t know anyone as a kid that liked brussels sprouts, but as an adult they’ve grown on me. It’s taken me a while to learn to like them. I’ve made Brussel sprouts before. My prosciutto caramelized brussels sprouts are amazing! Anything is better with bacon, or prosciutto, right? Brussel sprouts: Head to the produce department and make sure you choose fresh brussels sprouts. Stay away from frozen! Olive oil: You’ll need this to drizzle over the brussels sprouts before baking them. I use unfiltered olive oil to drizzle on the brussels sprouts rather than extra virgin olive oil. It just has better flavor. Garlic powder: I always have this spice on hand in case I don’t have fresh garlic handy. 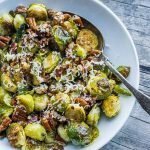 Vidalia onion: This sweet onion is diced and caramelized beautifully and really complement the brussels sprouts when you add the Maple Dijon dressing. Pecans: Make sure you pick up a fresh bag. We will be pan toasting these as we caramelize the onions. 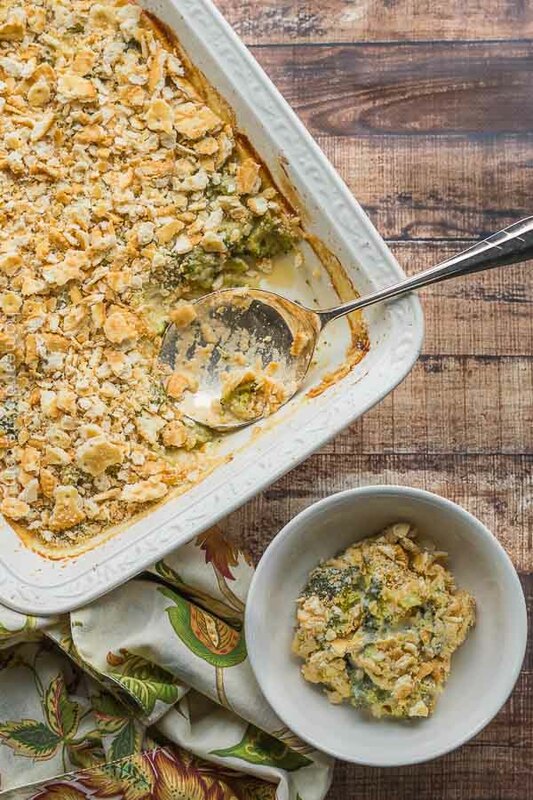 White cheddar cheese: We will sprinkle finely shredded cheese over the Brussels sprouts as the piece de resistence! Apple cider vinegar: You’ll need this for the dressing. Stone ground mustard: Not the yellow stuff. This particular type of mustard adds amazing flavor when mixed with maple syrup. Maple syrup: Not the corn syrup stuff but the real thing. Make sure you are using real maple syrup! This recipe is really easy to make and perfect for any holiday dinner. Clean and slice the brussels sprouts. Peel off the outer leaves and use a sharp knife to slice the brussels sprouts in half. Add them to a bowl. 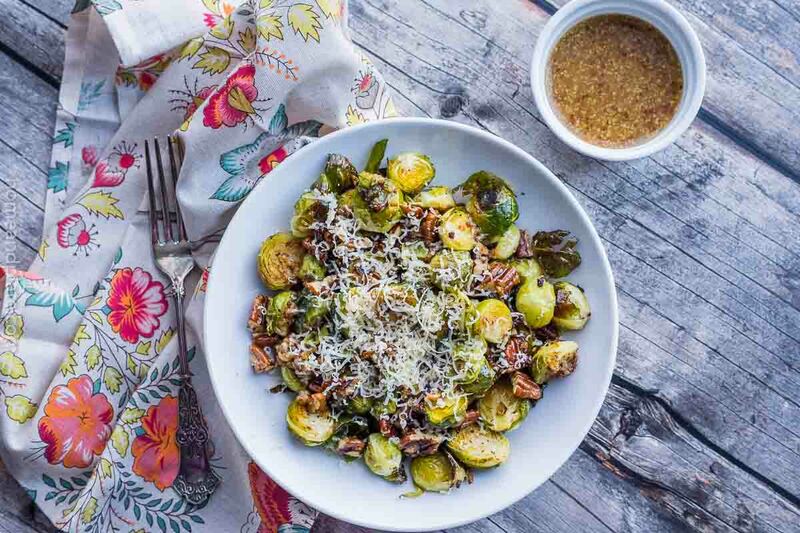 Drizzle olive oil over the brussels sprouts. Then season the sprouts with garlic powder, salt and pepper. Prepare your baking sheet. Line with aluminum foil or a silpat sheet. Arrange the brussels sprouts evenly on the sheet pan and place them in the oven. Roast until golden brown. Bake for 20 minutes. The brussels sprouts should take on a nice charred look. Sauté the onions. 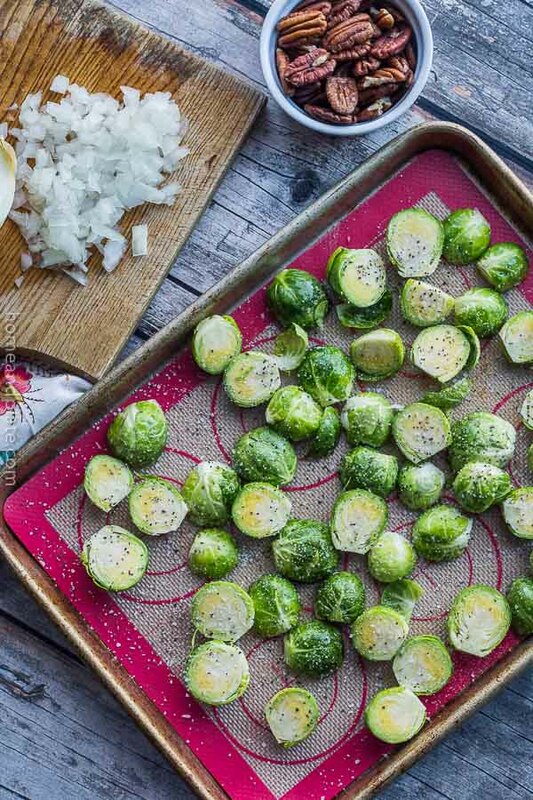 While the brussels sprouts are roasting, slowly sauté the onions over medium heat with a little bit of olive oil for about 10 minutes. Add the pecans. Time to toast these pecans until they take on a nice golden hue. Next, set the pan aside. Make the dressing. Combine the apple cider vinegar, water, maple syrup and mustard, then allow the sauce to simmer until it reduces slightly. Serve! 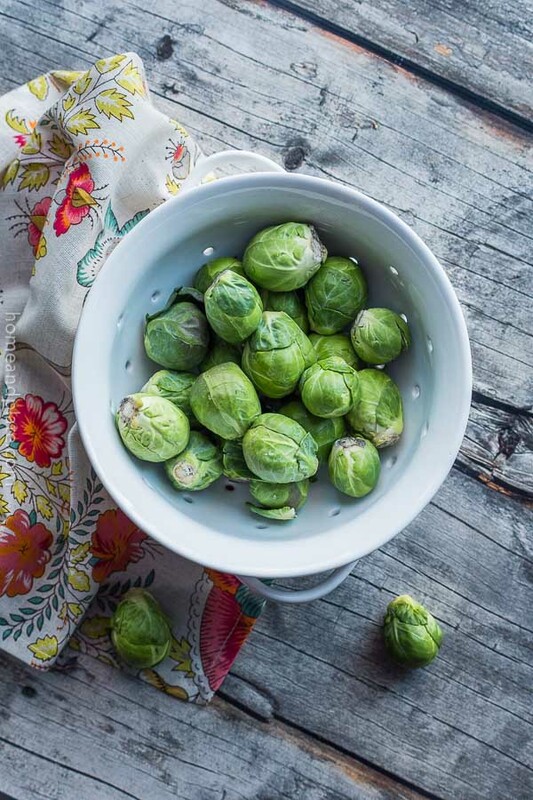 Remove the brussels sprouts from the oven and transfer them to a bowl. Mix in the pecan and onion mixture and drizzle with the dressing. Sprinkle the cheese on top and you are ready to go! Preheat the oven to 425°F. Line a baking sheet with aluminum foil or a silicone baking sheet. In a bowl, toss the brussels sprouts with 2 tablespoons of olive oil, garlic powder, salt and pepper. Arrange the brussels sprouts on the baking sheet then place in the oven for 20 minutes. Meanwhile, sauté the onions over medium heat in the remaining olive oil for about 10 minutes before adding the pecans. Continue sautéing until the onions are caramelized golden brown. In a small sauce pan over medium heat, stir together the apple cider vinegar, water, maple syrup and mustard. Allow the sauce to reduce slightly, about five minutes. Once the brussel sprouts have roasted and are golden brown, remove them from the oven and transfer them to a bowl. Add the onions and pecans and drizzle on the maple mustard sauce. Sprinkle the cheese on top and serve immediately. This incredible recipe is Godsend. I just bought a big bag of brussel sprouts from Whole Foods yesterday. I will try this recipe. 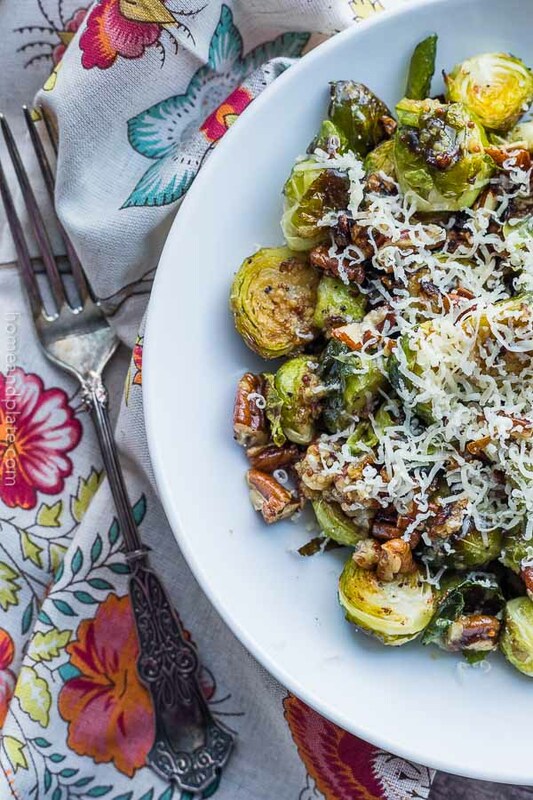 Brussel sprouts get a bad wrap but this recipe will turn anyone into a sprout lover. I’m glad to hear! Let me know how it turns out. Yummy! 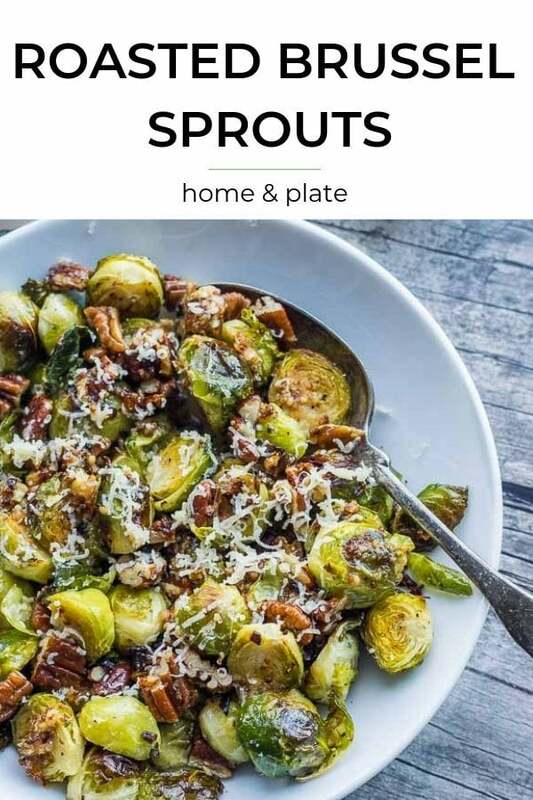 Never tried adding maple to brussel sprouts yet but I like the sound of it. Maple is going in to my next batch of brussel sprouts, period! It adds a sweet touch to the sprouts and the caramelized onions are a great contrast. Enjoy! This is one vegetable dish that I know I won’t have any problem getting my family to eat! I may have to get my portion before eveyone else starts digging in.